Anindito Purnowidodo Mechanical Engineering Department, University of Brawijaya, Jl. MT Haryono 167, Malang 65145, Jawa Timur, Indonesia. Khairul Anam Mechanical Engineering Department, University of Brawijaya, Jl. MT. Haryono 167, Malang 65145, Jawa Timur, Indonesia. Ari Wahjudi Mechanical Engineering Department, University of Brawijaya, Jl. MT. Haryono 167, Malang 65145, Jawa Timur, Indonesia. The crack growth behavior of fiber metal laminates (FMLs) with fiber orientations of 90°/0° and 45°/45° to load direction was investigated with varying stress ratios of the cyclic constant load. The study shows that crack growth behavior depends on the conditions of the cyclic load and the orientation of the fiberglass orientation. A higher stress ratio of the cyclic constant load causes fatigue life to decrease, and is associated with stress concentration just in front of the crack tip. The stress concentration in the FMLs with 45o/45o fiberglass orientation is higher than that of 90o/0o, which means the fatigue life in the former is shorter. The bridging of the fiber-epoxy composite takes place when the stress ratio of the constant cyclic load is lower than 0.4, which also enhances fatigue life. Nowadays, lightweight materials are commonly used in certain structures such as airplanes and boats, but these structures require high strength materials in order to ensure their safety. The strength to weight ratio is a parameter used to determine whether a material meets the requirement of a light weight structure or not. It is known that composites have a good strength to weight ratio, and in general airplane structures are made from these (Jones, 1999; Barsom & Ro?e, 1999; Stephens et al., 2001; Callister Jr. & Rethwisch, 2007; Jones et al., 2016). The strength and weight of a composite depend on the material composing it; in general, it is composed of two parts, the matrix and reinforcement (Jones, 1999; Callister Jr. & Rethwisch, 2007; Jones et al., 2016). There are several categories of composites, one of which is the fiber metal laminate type, also known as FMLs. This composite is used as the skin of an airplane body because its strength to weight ratio is very good (Jones, 1999; Callister Jr. & Rethwisch, 2007). FMLs are composed of at least two plies of different materials. To reduce weight, a metal ply is usually combined with a ply of a fiber based composite (Jones, 1999). Carbon or glass fiber is used as the reinforcement of the composite. It is almost inevitable that structures are subjected to dynamic rather than static load, and most cases of component failure are associated with this type of load (Barsom & Ro?e, 1999; Stephens et al., 2001; Jones et al., 2016). Dynamic load is more of a danger to the components of a structure than static load, although the magnitude of dynamic load is much lower (Barsom & Ro?e, 1999; Stephens et al., 2001). Fatigue failure is a type of failure relating to dynamic load, which originates in a crack initiation in a component; the crack then grows to a critical length. If the crack reaches this critical length, the component is no longer capable of carrying the load, so it will fail. To estimate the lifetime of components subjected to dynamic load, a method based on crack growth is often used; using this method, the lifetime of components can be estimated before cracks reach a critical length. In practice, to estimate the lifetime of a component based on fatigue crack growth, the crack growth behavior must be understood, which is greatly affected by the dynamic load conditions and the type of materials (Bao & McEvily, 1995; Sadananda et al., 1999; Purnowidodo et al., 2004; Purnowidodo et al., 2007; Purnowidodo et al., 2009; Purnowidodo et al., 2016). Crack growth caused by fatigue load may also take place in the components of structures made from composites. However, the fatigue crack growth behavior of composites is not as fully understood as that of metals (Khan et al., 2011; Jianyu et al., 2012; Huang et al., 2015). This is because composites are composed of several kinds of materials, leading to different crack growth behavior for different types of composite. Besides composite type, the loading conditions also affect fatigue crack growth behavior. In previous studies (Khan et al., 2011; Huang et al., 2015), the crack growth of FML composites was investigated under variable loading conditions, in which the cyclic loads were returned to the constant cyclic loads existing before the overload, and the crack growth was investigated after application of the overload. The investigations show that crack growth behavior after the overload depended on the delamination occurring in front of the crack tip. In this study, because the variable cyclic loads relate not only to the overload, but also to other loading conditions such as variations associated with the magnitude of cyclic loads, the mean stress, or the stress ratio of the cyclic loads, the investigation of the crack growth of the FMLs was investigated with varying loading conditions. Moreover, FML strength is also influenced by the orientation of the fiber (Khan et al., 2011; Jianyu et al., 2012; Huang et al., 2015: Dadej et al., 2017). Hence, observation of the crack growth was also made on FMLs with different fiber orientations in each stress ratio. 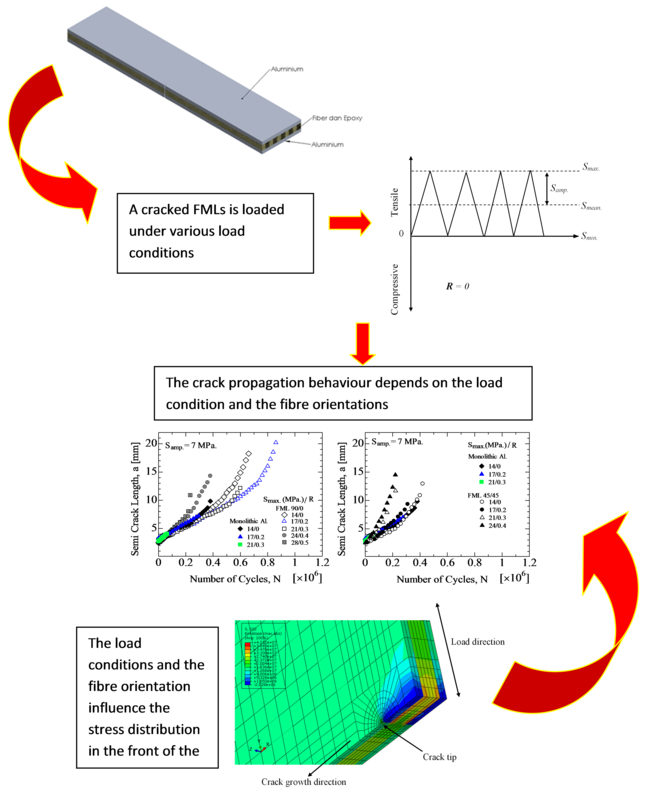 The study shows that the crack growth behavior of FMLs under a cyclic constant load is influenced by the conditions of the load. It can be concluded that the crack growth behavior is affected by the stress ratio and the fiberglass orientation. A higher stress ratio causes the stress concentrating just in front of the crack tip also to be higher, which causes the fatigue life to decrease. Because this concentration in the FMLs with 45o/45o fiberglass orientation is higher than that of the 90o/0o cases, the fatigue life of the 45o/45o FMLs is shorter. In addition, bridging of the fiber-epoxy composite takes place when the stress ratio of the constant cyclic load is lower than 0.4, which also enhances the fatigue life.